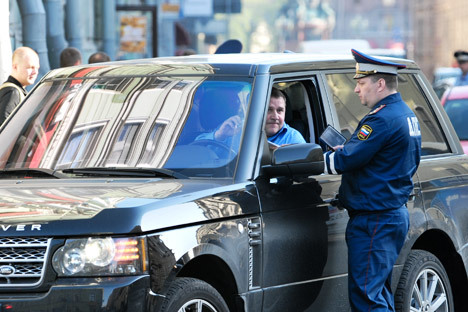 Russia plans to return to the traffic penalty system used in Soviet times. The system, however, is not that outdated, as similar regulations are currently enforced in a number of other countries in Europe. Duma deputies are now arguing that the country’s Administrative Code provisions concerning violations committed on the road need to be amended. Deputies suggest introducing a scale of fines that increases with each subsequent offense, as well as a threshold level for suspending licenses. Drivers who commit major offenses, such as crossing into the oncoming lane or exceeding the speed limit, will also face penalties. United Russia deputy Vyacheslav Lysakov told Izvestia that such measures are crucial for improving self-discipline in drivers. “A similar system was used in the Soviet Union, and it proved quite successful. Let’s assume an intoxicated driver crashes into a bus stop and kills an innocent bystander. The investigation reveals that the driver had a record of 50 fines. If that number had somehow been taken into account, the tragedy could have been prevented,” Lysakov said. Deputy Aleksandr Sidyakin supports his fellow party member, stipulating that the proposed method will work effectively only if an adversary principle is in effect. The Soviet Union used its own point system (a three-strike – or “three-hole” – system) for road traffic offenses. The regulations were quite clear: each violation resulted in punching the driver’s “offense ticket,” which was attached to the driver’s license. The third hole meant the suspension of the license for a year. The hole-punching system was succeeded by the point-based system, under which road traffic offenses were recorded on a temporary permit that was held by all drivers at all times. The points given out by the traffic police depended on the severity of the violation — 15 points suspended the license for a year. After the liberalization of the Administrative Code, this system was also discontinued. “Today, judges tend to believe policemen over drivers. So, once this electronic record-keeping system has been established, there will be a need to introduce some sort of adversarial proceedings in court. If you have been treated unjustly by the traffic police, prove it in court or bring an eyewitness, and the court will examine all evidence presented at the trial. In this case, there is no need for fretting over a false record or illegal suspension,” Sidyakin said. A similar point system has long operated in many other countries with great success. In Germany, for instance, drivers start out with a certain amount of points that decreases with each offense. It is the opposite in the UK, where each violation accrues a certain number of points. Regardless of whether a driver runs out of points or reaches a certain threshold over the course of one year, the result is the same: the driver’s license is suspended. Moreover, insurance costs also rise in relation to the driver’s score. According to Yevgeny Fyodorov, a member of the State Duma’s Budget and Tax Committee, such a system helps to eliminate the correlation between a person’s income and the severity of a penalty. “On a practical level, the current system doesn’t work for drivers with high income levels; they don’t pay much attention to the fines and tend to commit offenses more often. There needs to be some kind of long-term deterrent, and I think that accumulating offenses is the best option,” Fyodorov said. Duma deputy Andrei Kolesnik believes that the reinstatement of the old system will also improve road safety. “This may cause outrage among drivers, but the system must be introduced. Disciplining speedsters is a good thing. If you don’t like the severe penalties, don’t break the rules. As of today, we have a number of drivers who have committed as many as 200 or even 300 offenses. If the point system is an efficient restraining factor, capable of saving at least one life on the road, then we definitely need it,” said Kolesnik. Nevertheless, Viktor Pokhmelkin, the president of the Russian Drivers’ Association, remains firmly opposed to the reinstatement of the point-based system.